Single-cell analysis is growing in popularity. Visualizing processes within individual cells, whether using microscopy or creating maps of gene expression, is garnering a deeper understanding of how cells within the same tissue may behave differently from one another, despite appearing similar on first glance. “If I were to study a human population, I could distinguish males and females—two subpopulations—but in terms of who was suffering diabetes, you can only see the difference when you get a closer look,” says Akos Vertes Ph.D., professor of chemistry and professor of biochemistry and molecular biology at George Washington University. Dr. Vertes will be one of the speakers at the 6th Annual Single-Cell Analysis Congress, part of the Genomics and Synthetic Biology Series UK, scheduled for November 8–9. Among the topics to be covered are the use of fluorescence microscopy and microfluidics to classify cancer and rare diseases, and to understand how mRNA travels from the nucleus to the cytoplasm within a cell. One such study is by Diether Lambrechts, Ph.D., a professor and engineering in oncology genetics at VIB-KU Leuven. He will present a study to map the microenvironment of lung tumors, with the aim of creating an atlas of cell types that—in the future—could help clinicians improve their classification of lung tumors. “In the future, we could use the atlas to classify a person’s lung tumor to determine if it’s aggressive and which treatments it responds too,” he explains. Dr. Lambrechts and his colleagues took tissue samples from five patients with lung cancer. The samples came, not just from the tumor, but also the surrounding area. The tissue was dissociated into single cells and then processed using what’s now a mainstream single-cell RNA sequencing technique. This involves passing the cells through a microfluidic device that encapsulates them into gel beads, along with barcoded oligonucleotides and reverse transcription reagents. When the cells are lysed and the gel beads dissolved, the barcoded RNA is released into solution ready for sequencing. 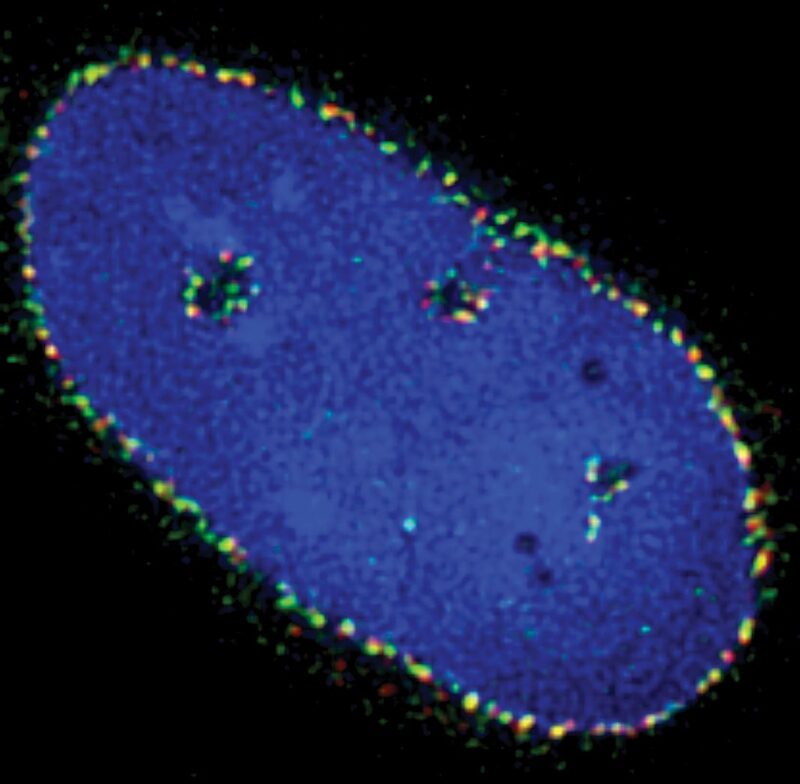 Since each cell has a different barcode, the RNA could be associated with a particular cell. According to Dr. Lambrechts, his team’s study was special because it looked at every cell in the tumor—rather than preselecting specific cell types. It was able to classify the types of cell in the tumor according to the RNAs that were expressed, and it could create complex images showing the marker genes associated with both malignant and nonmalignant cells. As well as categorizing tumor types, the the technology will be used, Dr. Lambrechts hopes, to monitor how tumors respond to treatment. “We can see what has changed at a single-cell level,” he asserts. At George Washington University, scientists led by Akos Vertes, Ph.D., have used laser-ablation electrospray ionization mass spectrometry to conduct in situ metabolic profiling of living plant systems. 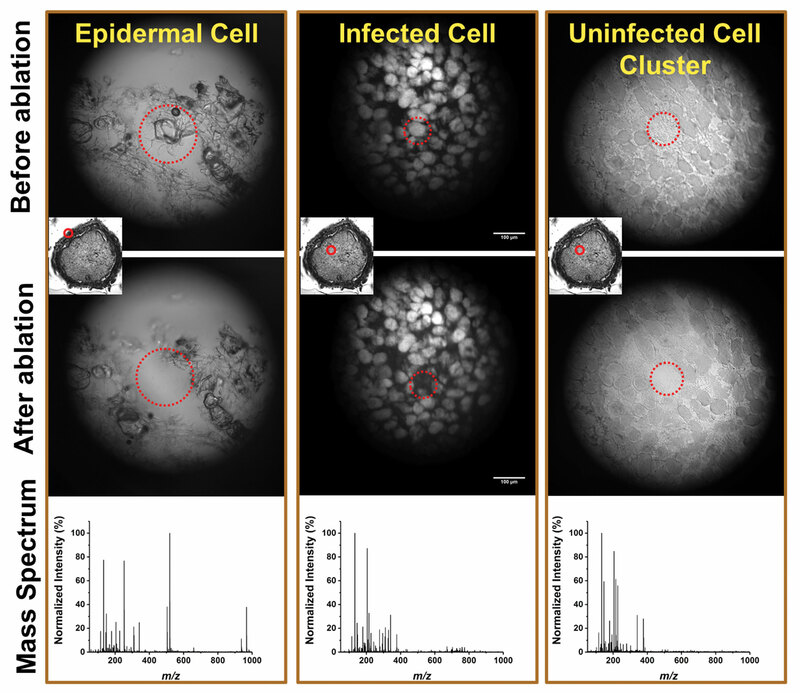 In these brightfield and brightfield/fluorescence microscopy images, from a poster co-authored by Dr. Vertes, soybean cells of different types (epidermal, infected, and uninfected) are shown. Both the epidermal and infected cell types were sampled as single cells while, due to the small size of the uninfected cells, small cell clusters were analyzed. Corresponding mass spectra are provided for each cell type. Dr. Ménager used a method similar to Dr. Lambrechts’ for analyzing gene expression. However, instead of mapping RNA expressed by tumor cells, he compared the gene expression of cells from patients with the gene expression of cells from controls. His aim was to identify clusters of cells that differ and might shed light on underlying disease mechanisms. In the longer term, his ambitious plans include using AI and machine learning to create a map that shows—in a visual form—the molecular pathways that control gene regulation. “We can plot the differences between patients and controls, and understand pathological processes in a new, unbiased way,” he says. Using 10X Genomics’ Chromium DNA partitioning workflow for genome sequencing, scientists at Institute Imagine led by Mickaël Ménager, Ph.D., devised a way to characterize autoinflammatory disease via single-cell transcriptome-based network interference. Note that in the single-cell RNA sequencing technique shown here, cells are passed through a microfluidic device, encapsulated, and lysed to release barcoded RNA. Yaron Shav-Tal, Ph.D., a professor of biology at Bar-Ilan University, will discuss live-cell imaging and fluorescence microscopy as a way to observe mRNA directly. “We research how mRNA is exported from the nucleus to the cytoplasm via the nuclear pore complex,” he explains. Usually mRNA travels quite slowly inside cells, bumping into DNA, but when it reaches the nuclear pores it’s kicked out into the cytoplasm in a short time frame. This discovery was of interest to researchers seeking to understand intracellular processes, but the export process was hard to detect. Dr. Shav-Tal and his colleagues believe they’re the first to use fluorescence lifetime imaging microscopy (FLIM) with fluorescence resonance energy transfer (FRET) microscopy to track mRNA as it travels through the pores. FLIM-FRET microscopy allows scientists to look at dynamic processes within cells at high spatial (nanometer) and temporal (nanosecond) resolution. The team used FLIM-FRET and live-cell imaging to follow single mRNAs through the pores, and it focused on the interactions of the pore with TAP, an export receptor complex. Using FLIM-FRET, they discovered that TAP plays an important role in the final stages of mRNA’s passage toward the cytoplasm, at which point a helicase motor protein assists in pulling the mRNA out of the pore and separating it from the TAP protein. The TAP protein is then recycled so that it can look for new mRNA. “Metabolomics and proteomics at the single-cell level are still at the beginning of their emergence,” says Dr. Vertes. 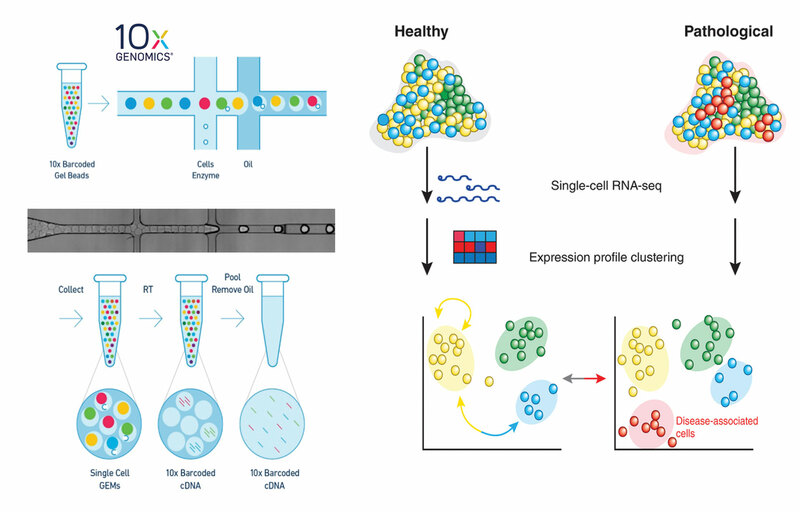 Technologies such as PCR have helped researchers to amplify tiny amounts of RNA extracted from a single cell. However, no similar technologies exist for amplifying cell proteins and metabolites—his primary area of study. Dr. Vertes turned to fluorescence microscopy to help him analyze rare cells. “We built a dual-channel microscope that images cells in brightfield and fluorescence mode simultaneously, and combined this with a laser-ablation technique developed in our lab,” he says. This technique had been applied to multiple cells, but he tweaked it for use with single cells. The laser-ablation electrospray ionization (LAESI) system uses a sharpened optical fiber to deliver mid-infrared laser light directly to individual cells. The laser light ablates the cells and ionizes the ablation plume, which can be analyzed by mass spectrometry. At the same time, a dual-channel microscope visualizes both the cell morphology and fluorescent labels. Dr. Vertes has used the system to distinguish infected and uninfected cells. “There are efforts in other places to combine methods for single-cell analysis with fluorescence microscopy, but I think we have an edge combining it with the laser-based system,” he asserts. Do CRISPR Risks Outweigh Rewards?